This page gives advice for beginners who are either thinking of buying a telescope, or have just bought one and are wondering how to use it, and what they could see. If you’re unfamiliar with the characteristics of different types of telescope, it’s recommended that before buying one, either submit queries using our Contact us page contact form, or better still, come to one of our friendly meetings for advice – see our Programme page. Buying and using a small beginner’s telescope. Before buying a telescope, first use your eyes to familiarise yourself with the night sky over the UK. Next progress onto binoculars to learn more about the night sky with the help of this interactive planetarium that’s set to display the sky above Southport, when date and time are specified. Finally buy your telescope with characteristics that best suit the celestial objects that interest you. The Jodrell Bank Centre for Astrophysics website provides advice on buying and using telescopes and binoculars, and 7 x 50 mm Porro prism binoculars such as these would be a good choice. Wes Stone has also created a good amateur astronomers website that includes a helpful beginners page entitled So you bought a small telescope…. (or planning to buy one), where small is defined as refractors with objective lens diameters between 50 & 90 mm, and reflectors with mirror diameters between 75 & 110 mm. Advice is given on what features are important, e.g. a sturdy mount to minimise vibration/shaking, and what features should be discounted, e.g. unrealistically high magnification. As a rule of thumb, under typical UK seeing conditions a magnification upto 10-12 X per 10 mm (25-30 X per inch) of aperture is realistic, and with premium optics – v expensive & perfect seeing conditions – very rare in UK, upto 20 X per 10 mm (50 X per inch) may be possible. This link enables you to calculate the resultant magnification, exit pupil, and true field of view, when the aperture diameter, focal length (or focal ratio) of a telescope and eyepiece focal length and field of view are submitted. Having bought your telescope, keeping the optical surfaces of the objective lenses, mirrors, eyepieces and filters clean is important, and advice on how to do this without damaging them can be found here. What’s up there to look at? It’s important to appreciate that astronomical seeing conditions at any given observing location vary from night to night, and are classified by the Pickering scale that varies between 1 (v poor) and 10 (perfect). To help judge how stable the atmosphere is, click here to see 10 animated illustrations showing how increasing levels of atmospheric turbulence distort bright star images. The Atmosphere and Observing confirms much of the UK has poor seeing conditions, so it is helpful to observe celestial objects either located towards the zenith (overhead) or when approaching their meridian crossing or culmination (highest point above the horizon). This is when the atmospheric light-path will be at its shortest, rather than when they are low near the horizon when it’s at its longest. The easiest and brightest object to start observing for beginners is the Moon, and this interactive lunar map should help identify its major features. To see the daily Moonrise, Moonset, and meridian crossing times for the month in the Merseyside region, click here, (click any day for more details), and for details of lunar eclipses click here. The ideal time for observing planets is when they are closest to the earth (either inferior conjunction for inner planets or opposition for outer planets), and conversely the worst time is when they are furthest away (either superior conjunction for inner planets or conjunction for outer planets). The diagram illustrates the key relationships of the planets wrt the earth (Image Credit: Wmheric), and this link shows their current positions in the solar system. For details about planets visible in the Merseyside area see here, and for celestial objects of interest in the Northern night sky during the month, see Jodrell Bank’s Centre for Astrophysics The night sky this month page compiled by Ian Morison. Wes Stone’s website also has page links listing what one can expect to see, such as planets, the moon, together with catalogues of suitable double stars (all potentially separable with a good 60 mm refractor), and brighter deep sky objects, especially open star cluster that are easier to recognise through small aperture telescopes. For observing deep sky objects (e.g. Messier catalogue objects like galaxies, nebulae and star clusters) it must be stressed they are generally dim and extended compared with stars and planets, so telescopes with larger apertures are best, and a 150 mm (6 inch) f 6 Newtonian would be a reasonable beginners option. Deep sky objects are best observed under remote dark sky conditions well away from city lights. To improve contrast and enhance surface features on planets, and with larger aperture telescopes, fainter dark sky objects, filters can be threaded onto the eyepiece. When used with smaller aperture telescopes care is needed, because these filters will to varying degrees, reduce planetary image brightness. A good choice for enhancing surface features with small aperture telescopes is the 82A light blue filter, and for larger aperture telescopes the 80A blue filter is better, and will also reduce lunar glare. For regular lunar observing a grey neutral density lunar filter is ideal, and improves contrast without introducing colour bias. For small aperture telescopes (upto 80 mm) the 25% transmission filter is preferable to the 13% transmission one, which is better suited to larger aperture telescopes. This link gives details of colour filters for observing planets, and this link describes specialist filters suitable for improving contrast and/or enhancing details of deep sky objects. These specialist filters are classified as either narrow band or broad band. A general rule of thumb is for telescopes with an aperture > ~150 mm narrow band filters are preferable, but < ~150 mm of aperture broad band are better because they pass more light. To safely observe the Sun it’s important to never look directly at it through a telescope or its finderscope, binoculars, or any type of magnifying lens, because to do so will result in immediate permanent damage to your eye(s). The best, and safest way to observe the Sun, is to remove the finderscope and securely place a metallised glass solar filter with a blocking factor of ~100,000 over the aperture, as this afocal photograph taken with an i-phone through a 32 mm eyepiece on a 5″ Maksutov Cassegrain telescope illustrates. With a magnification of ~ 50 or more, sunspots can be seen as the dark spots on the photo confirms, also future planetary transits can be seen, with the next one visible in the UK, being Mercury with ingress around 12.35 pm on 12/11/2019. The cheapest option with refractors is to project an image of the sun onto a white card, and for best results attach a shade collar to the optical tube. Alternatively, for excellent results with refracting telescopes a Herschel wedge can be used like this one. 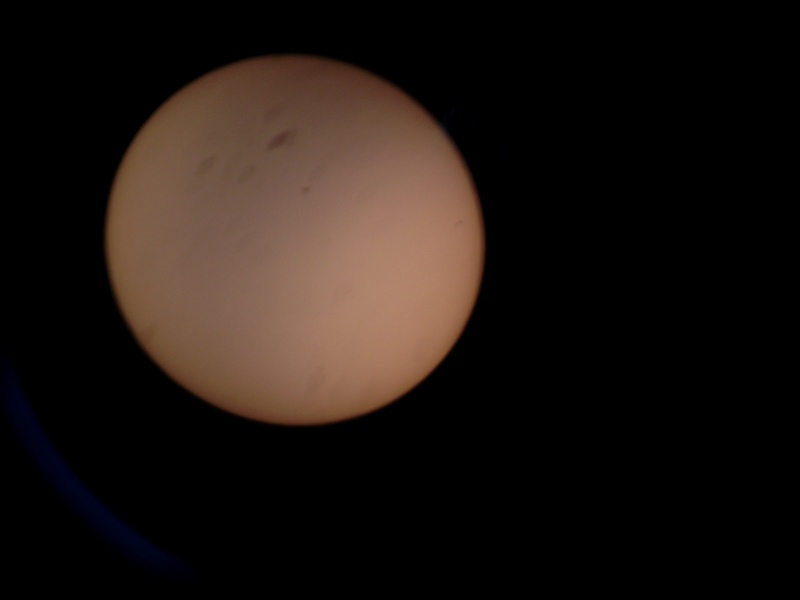 When using reflecting telescopes high temperatures can develop within the optical tube damaging internal components, especially with closed catadioptric designs like Schmidt or Maksutov Cassegrain telescopes, so it’s strongly recommended a full aperture solar filter is always used for solar observing. For more information about observing the Sun click here. For meteor showers visible over Merseyside see 2019 Meteor Shower Calendar and click their names for more details, and for comets see Bright comets for 2019, and look out for the only bright comet this year 46P/Wirtanen, which is visible to the naked eye in a dark sky during its passage through Camelopardalis during January. For UK displays of the Aurora Borealis (Northern Lights), visit AuroraWatch UK where you can choose to sign up to receive e-mail alerts. There are two celestial co-ordinate systems used for locating celestial objects, the Altitude Azimuth and Equatorial system. Its important to understand these, particularly the equatorial system that uses right ascension and declination when reading star charts and using telescopes. For downloadable and printable night sky charts visit Astronomy Now and go to their UK Night sky chart. and Almanac pages. The latter defaults to the current date and time, and also includes options for giving details of ISS passes over the UK, transits of Jupiter’s Galilean moons, and its Giant Red Spot across its visible face. It’s well worth buying a suitable power pack for operating “GOTO” telescopes and their computerised drive systems; some also include a spotlight to help with setting up, and importantly, a red light for reading star maps etc. without compromising your night vision, such as this one. It’s also essential to buy a good sky atlas such as Turn Left at Orion: Hundreds of Night Sky Objects to See in a Home Telescope – and How to Find Them, and for beginners a Planisphere is useful. A virtual planisphere created by the OU is available here; click the clock and set current date & time for a view of the night sky in the planisphere window, then explore the pages and drop down menus for information about objects of interest. Finally, for the latest information on space exploration, discoveries and images, visit ESA, ESA Science & Technology and NASA’s Home page. For current information about the Sun-Earth system visit Space Weather.